Injury from laser pointer trauma is a public health problem on the rise. In the past few years, injuries or incidents involving accidental or intentional laser pointer exposure have been on the rise, and these events are now becoming dangerously common. The media has reported several instances of intentional laser exposure of professional and collegiate athletes during prominent events such as FIFA World Cup and National Football League games.1,2 Fans who intentionally expose athletes to laser radiation are usually unfamiliar with the potential damage that these devices can cause to the eye. However, despite the campaign to increase public education and impose punishments for these felonies, the volume of laser incidents with aircraft has continued to increase, from 46 in 2004 to more than 3000 per year since 2010. Perhaps the greatest concerns are raised by reports of unsupervised children who have received these lasers as toys or gifts and expose themselves to the laser beams, causing permanent retinal injury with reduced central vision (Figure). From 2000 to 2009, there were five reports of 18 patients with injuries due to laser pointer exposure.5,6 Over the past 4 years there has been a sharp rise in the number of reported laser pointer injuries in children, with at least 36 identified by a Pubmed search (search terms: retina, laser injury, laser pointer). The vast majority of cases involved males younger than age 18 years, including one child as young as 9 years.6,7 The injuries were typically sustained by staring directly at the laser pointer beam, by staring at a laser pointer beam reflected off a mirror, or by being exposed by another person. Figure. Color fundus photograph and corresponding optical coherence tomography scan through the fovea of the right eye of a 9-year-old patient at initial presentation 3 days after laser injury (A) and 1 year after laser injury (B). The laser in this case was a red 654 nm handheld laser of 121 mW power. Lasers can cause a variety of types of retinal injures depending on the power and wavelength of emission.8 The power (energy delivered) and duration of laser exposure are the two major determinants of whether injury to the retina occurs and, if so, the extent of injury. Lasers employ three mechanisms capable of damaging retinal tissue: thermal, photochemical, and mechanical. Thermal photocoagulation is typically the mode of action of lasers used in the clinic for panretinal photocoagulation, such as argon and krypton lasers. The energy from these lasers is transferred to the pigment of a cell, and a resulting rapid increase in temperature causes protein denaturation and cell death. Photochemical damage occurs when a laser’s optical radiation causes phototoxic chemical reactions, again resulting in cell death. The same type of damage is seen from solar retinopathy or exposure to arc welding. Mechanical damage may occur when a laser’s energy absorption takes place over a short pulse duration and there is creation of a plasma and water vaporization, leading to tissue disruption. Nd:YAG lasers use the mechanism of mechanical disruption in the treatment of certain ocular conditions. The American National Standards Institute (ANSI) is the body that regulates lasers manufactured and sold in the United States. ANSI requires that lasers marketed and sold as “laser pointers” be in class 3A, which encompasses lasers of 1 to 5 mW or less of power. This means a laser pointer can have a maximum power of 5 mW and a wavelength between 400 and 700 nm. The US Food and Drug Administration (FDA) describes class 3A lasers as being hazardous if the beam is viewed directly, even momentarily. Another category, “handheld” lasers, can be more powerful: either class 3B (5-500 mW) or class 4 (> 500 mW), and these lasers may cause immediate skin and eye hazard when viewed directly, according to the FDA. In other words, any laser with a power greater than 5 mW has the potential to immediately and negatively impact vision when viewed directly. Unfortunately, “handheld” lasers greater than 5 mW are readily available through websites from distributors in Asia. A Google search for “high-powered laser pointer” returns many websites selling so-called “laser pointers” rated at up to 2000 mW of power. This is 400 times more powerful than a 5-mW laser, the FDA’s top limit for laser pointers. A 2000-mW laser is capable of popping a balloon or melting plastic from up to 50 feet away. Also unfortunate is that high-powered class 3B handheld lasers can look identical to laser pointers of less than 5 mW of power. It may therefore be impossible for parents to understand the dangers a laser poses to their children. That is, of course, unless they understand what the power listed on the device signifies, which most parents—and most physicians, for that matter—do not. Some of the most powerful handheld lasers resemble weapons and are required to come with a key switch to activate the laser, but many class 3B lasers come without a key switch and resemble any laser pointer used in a classroom. Even if a laser is labeled with its power output, as required by the FDA, the product’s actual specs often do not agree with its labeling. A study measuring the power of 122 laser pointers labeled as class 3A (1-5 mW) found that 44% of red laser pointers and 90% of green laser pointers tested had power outputs greater than 5 mW.9 Moreover, some green handheld lasers pointers create a 532 nm wavelength by using an infrared 1064-nm Nd:YAG crystal. Unless the laser has an infrared filter, some 1064-nm radiation will escape the laser and be present in conjunction with the 532-nm green light. Infrared light is not part of the visual spectrum. There is no aversion response when one looks at infrared light, and this results in longer durations of exposure to harmful radiation and greater potential for retinal injury. Blue and violet lasers introduced to the market recently are alarmingly high-powered, up to 1000 to 2000 mW. Alsulaiman et al reported 14 blue laser injuries in a span of 1 year in Saudi Arabia, causing the development of full thickness macular holes or prehyaloid hemorrhages with dense epiretinal membrane formation.11 The blue wavelength may focus more anteriorly in the retina due to its shorter wavelength and cause damage to the vitreoretinal interface, resulting in the pathologies reported. Inappropriately used class 3B or 4 lasers should be considered weapons that can cause serious, permanent bodily injury. Even brief exposures to diffused rays of laser beams can cause temporary flash blindness that may last for hours in airline pilots, endangering the lives of passengers, particularly during takeoff and landing sequences. Cases of short-range laser exposure are becoming more common, often involving children who are inappropriately given these devices as toys, and these patients are referred to retina specialists after the damage has already occurred. Clinicians, particularly retina specialists, can raise awareness of this rising public health issue by educating patients and parents about the hazards of laser pointers. Legislation is currently being written to impose stronger regulations on the distribution and sale of these devices. 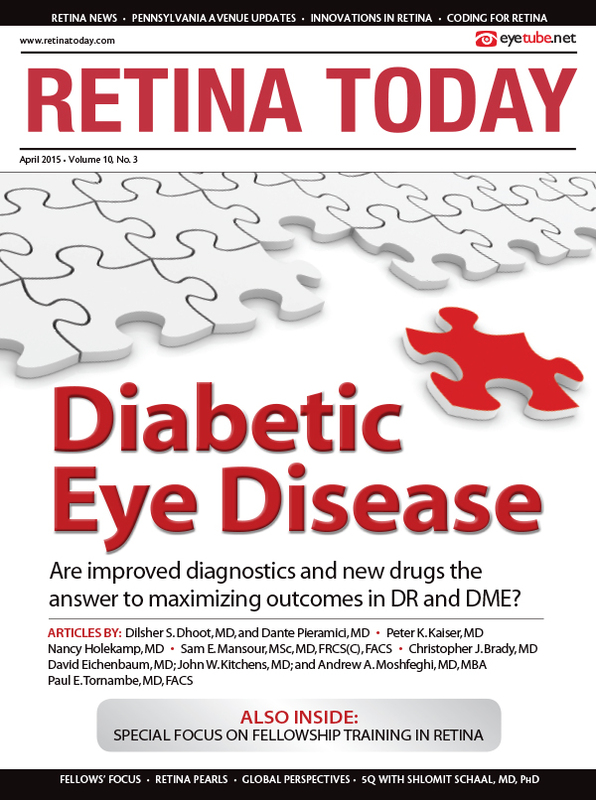 If a patient presents with findings of a laser-related retinal injury, clinicians should report the incident to the FDA so that investigations can be performed into the manufacturers of these devices. Reports can be made at www.fda.gov/downloads/AboutFDA/ReportsManualsForms/Forms/UCM236066.pdf. Gregory D. Lee, MD, is an ophthalmology resident at the New England Eye Center, Tufts University, Boston, Massachusetts. Next year he will be a first-year surgical vitreoretinal fellow at the Retina Associates of Kentucky. Dr. Lee may be reached at gregdlee@gmail.com. David R. Lally, MD, is a second-year surgical vitreoretinal fellow at the New England Eye Center, Tufts University, Boston, Massachusetts, and Ophthalmic Consultants of Boston. Upon the completion of fellowship, he will be joining New England Retina Consultants in Springfield, Massachusetts. Dr. Lally may be reached at david.lally@gmail.com. 1. McCormick R. Laser beam zaps Russia out of World Cup. June 27, 2014. http://www.theverge.com/2014/6/27/5848598/russia-goalkeeper-shot-by-laser-out-of-world-cup. Accessed February 21, 2015. 2. Rogers M. Doctor: Powerful lasers at NFL games are “weapons.” USA Today. October 7, 2014. http://www.usatoday.com/story/sports/nfl/2014/10/07/national-football-league-laser-pointers-buffalo-bills-detroit-lions/16870235/. Accessed February 21, 2015. 3. Laser News, Laws, & Civil Penalties. Federal Aviation Administration. January 13, 2015. http://www.faa.gov/about/initiatives/lasers/laws/. Accessed February 21, 2015. 4. Fresno laser striker sentenced to 14 years in prison [press release]. US Federal Bureau of Investigation. March 10, 2014. http://www.fbi.gov/sacramento/press-releases/2014/fresno-laser-striker-sentenced-to-14-years-in-prison. Accessed March 4, 2015. 5. Turaka K, Bryan JS, Gordon AJ, et al. Laser pointer induced macular damage: case report and mini review. Int Ophthalmol. 2012;32:293-297. 6. Lee GD, Baumal CR, Lally D, et al. Retinal injury after inadvertent handheld laser exposure. Retina. 2014;34(12):2388-2396. 7. Yiu G, Itty S, Toth CA. Ocular safety of recreational lasers. JAMA Ophthalmology. 2014;132:245-246. 8. Barkana Y, Belkin M. Laser eye injuries. Surv Ophthalmol. 2000;44:459-478. 9. Hadler J, Tobares E, Dowell M. Random testing reveals excessive power in commercial laser pointers. J Laser Appl. 2013;25:032007. 10. Robertson DM, Lim TH, Salomao DR, et al. Laser pointers and the human eye: a clinicopathologic study. Arch Ophthalmol. 2000;118:1686-1691. 11. Alsulaiman SM, Alrushood AA, Almasaud J, et al. High-power handheld blue laser-induced maculopathy: the results of the King Khaled Eye Specialist Hospital Collaborative Retina Study Group. Ophthalmology. 2014;121:566-572.e1. 12. Rusu I, Sherman J, Gallego-Pinazo R, Lam M, Freund KB. Spectral-domain optical coherence tomography and fundus autofluorescence findings in a case of laser pointer-induced maculopathy. Retin Cases Brief Rep. 2013;7(4):371-375. 13. Fujinami K, Yokoi T, Hiraoka M, et al. Choroidal neovascularization in a child following laser pointer-induced macular injury. Jpn J Ophthalmol. 2010;54:631-633. 14. Wyrsch S, Baenninger PB, Schmid MK. Retinal injuries from a handheld laser pointer. N Engl J Med. 2010;363:1089-1091.